The lifestyle at Briarwood is a healthy one. The Briarwood Community cultivates a culture of whole-person wellness that improves quality of life, maximizes health, and fosters successful aging. Take advantage of our Fitness Center with individualized physical assessments and consultations with physical therapist Holly Dufresne. Participate in Forever Fit with Greendale Y Fitness Instructor, Sue Colby; try Tai Chi with Gary LaChappelle or a zumba class. Many residents take the Senior Challenge and Brains & Balance with fitness consultant Joe Fish. Choose from the many options for whole-person wellness. Use our Spa services – massages, manicures, and pedicures are offered on campus. At Briarwood, residents have full and complimentary access to the Greendale YMCA nearby. Join the Briarwood group that does a weekly pool walking class at the Y! Physical wellness is an important aspect, but you’ll find variety in the learning opportunities and lectures at Briarwood, such as those offered by the Worcester Institute for Senior Education (WISE), sponsored by Assumption College. Frequently, classes are offered in classical music topics, historical periods, and the practical use of technology. 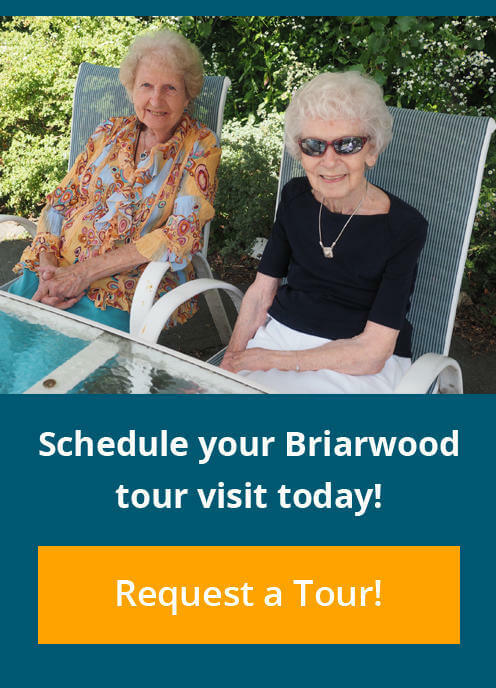 Good health and overall wellness encompasses more than the physical and intellectual workouts; Briarwood offers interesting and lively social, emotional, spiritual, and vocational opportunities every day of the week. You’ll find residents participating in book discussions, painting and writing groups, and informal gatherings following exercise. You meet some of the nicest people out walking on the campus, too!